Vivienne Nelson, Director: Vivienne has over 30 years' experience in the referencing market place and sat her ARLA and CII certificates in 2002. 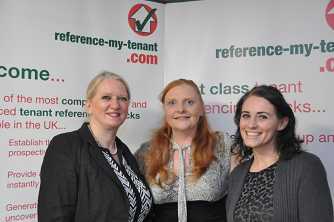 Unlike all other tenant referencing companies, which are run by insurers, Vivienne's consumer credit reference agency background, together with her vast knowledge of the data sets, ensures the referencing service reference-my-tenant.com provides to its clients, is one of the most detailed, reliable and comprehensive available. In Vivienne's previous role, at Sequence UK Ltd, she created Sequence's own in-house referencing solution, which was launched to over 100 of their branches in February 2007. Prior to this Vivienne spent several years with Experian, developing the online referencing platform we use today. This platform was then introduced to the Letsure client base in 2002, and Vivienne moved over to transform their referencing business from an archaic paper and fax-back referencing service into the UK's leading (at that time) online platform. Vivienne's knowledge and understanding of the use of credit data in the lettings market is second-to-none and she has a 'can-do' attitude to ensure her clients are fully catered for. Lisa Hayes, Referencing Manager: Lisa joined RMT in February 2015, coming from a completely non-referencing industry. Lisa has worked her way from referencing advisor, to deputy manager to referencing manager in a very short space of time. Lisa runs the general office tasks, mainly looking after the office employees, checking that the processes we have in place are working how they should do. Lisa has a real passion for referencing, and she is always more than happy to help our clients. Jessica Nelson, Account Handler: Jessica joined Vivienne's previous referencing company as a referencing advisor back in 2007, and moved to RMT after some time away from the industry. Jessica has a direct link with all of RMT's clients, and her role is to make sure that all clients are happy with our service, have a full understanding of our products, carry out any face to face training with your teams, and will mould the RMT offering to complement your needs. We are a family run business, with family values. We treat our clients as colleagues, and not as account numbers. Most of our clients have been part of our business for many years. Our team of referencing advisers have been fully referenced checked themselves and have undergone an extensive training programme, prior to them offering advice to our clients, applicants and referees. All team members are multi-skilled and can assist with all queries. Client testimonials are available upon request.